"Lil' Tumbleweeds" Collection lets your inner cowboy out for a rompin' good time! Grab the reins of this digital collection and see which trail your creativity leads you down....is it a birthday, a layout or card for your real life or wanna be cowboy, or is it all about a vacation memory? Whichever it is, we're sure that you'll enjoy this Whoopin' Good Kit! 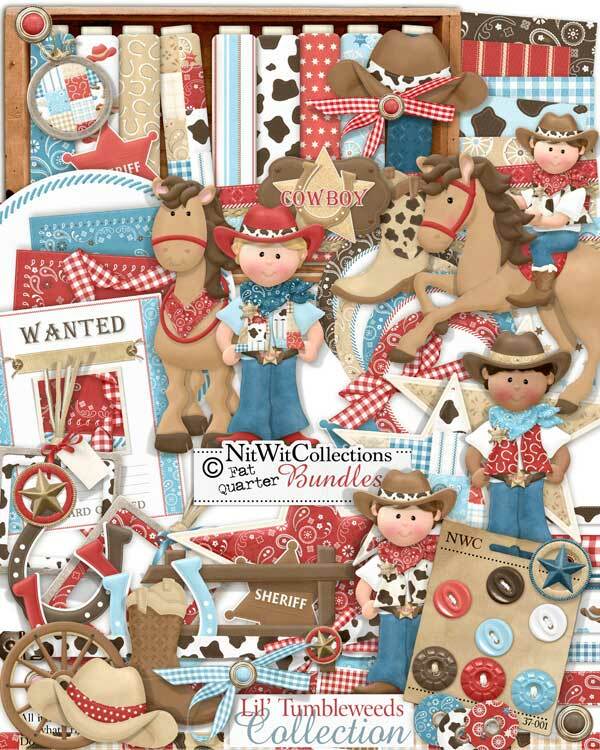 Looking for a complimenting cowgirl for your cowboy, check out our FQB - Lil' Wimmin Collection to rope in all those gals! 4 Bows - maybe to go with your best shirt? 3 Star Charms - maybe taken off my last hombre?? 3 Horseshoes - a trifecta of good luck! 1 Metal Tag - a good luck charm possibly?? 1 Wagon wheel - it fell off the wagon and I brought it along to fill with air....anyone know where the valve is?? 1 Wanted Poster - complete with a window to put in your favorite "Desperado"! !